Evelyn loves to draw, colour and doodle but still hasn't quite mastered the art of doing this without also colouring in herself and her clothing! 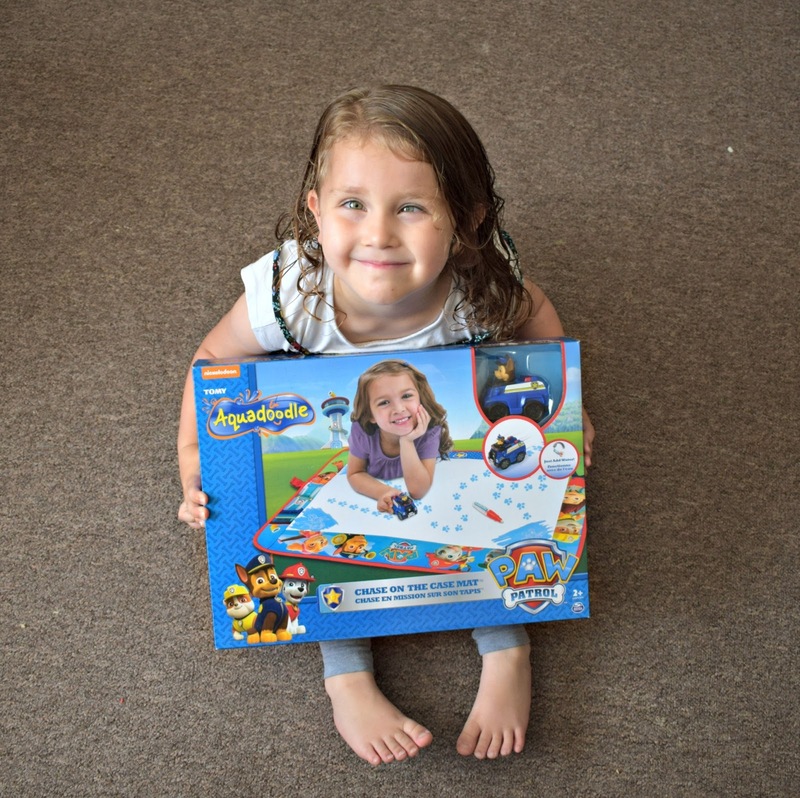 So when Tomy recently offered us the chance to try out a Tomy Aquadoodle I thought we might be on to a winner, even more so when it arrived and it was Paw Patrol themed... Evelyn's favourite. 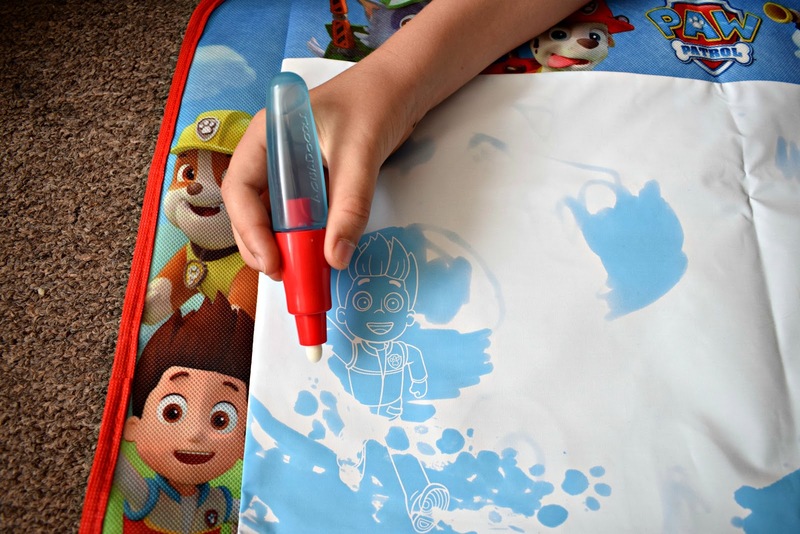 The Aquadoodle mat is a mess free alternative to drawing, it allows kids to be creative and draw without any of the mess pens or crayons can often make. Even better it doesn't waste paper as it only uses water so once dry leaves a blank canvas to start again! Each Paw Patrol Aquadoodle mat comes with an easy to grip chunky "pen" and a roll along Chase truck. These are easy to use with the pen just twisting apart and the truck just needing a small dish or plate of water to roll him through. 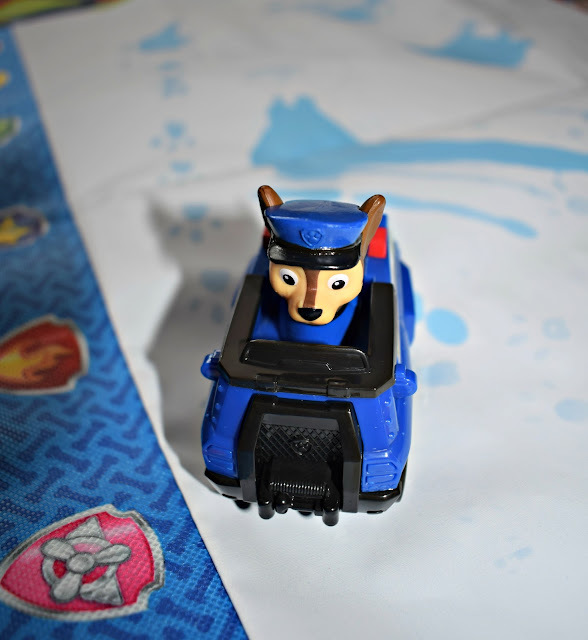 The mat also features colourful pictures of the familiar Paw Patrol characters around the edge of the mat. Evelyn is loving her new Aquadoodle and its her go to thing now over the pens every time! She loves trying to find the Paw Patrol characters that arehidden within the mat, I this was a great touch (the characters are hidden until you go discover them with water). The drawings stay long enough for her to enjoy but equally the mat dries fairly quickly meaning she never has to wait long for a blank canvas to start her next doodle. The Aquadoodle feels great quality and feels like it will really last which is always a quality I look for especially in kids toys! The pen that comes with the set is really easy to use, to fill you simple twist the blue section off and fill with water and replace the top. We found the Chase truck a little more tricky to get going but once we had worked it out he printed lots of paw prints as he was rolled across the mat. We discovered the Chase truck actually needs to be socked in water on a plate and rolled back and forth a few times to make sure the pads on the bottom are all wet. I think it would be a nice idea to have the set come with a little dish or tray to use with Chase as we only had big plates. However this really didn't effect the use or the fun Evelyn had! We really love this set! Its so much fun and mess free which is always a winner for me as a mum. It folds away tiny and neatly so easy to store when not in use. It dries quickly, I would say though to make sure its properly dry before tidying away to avoid any staining etc. 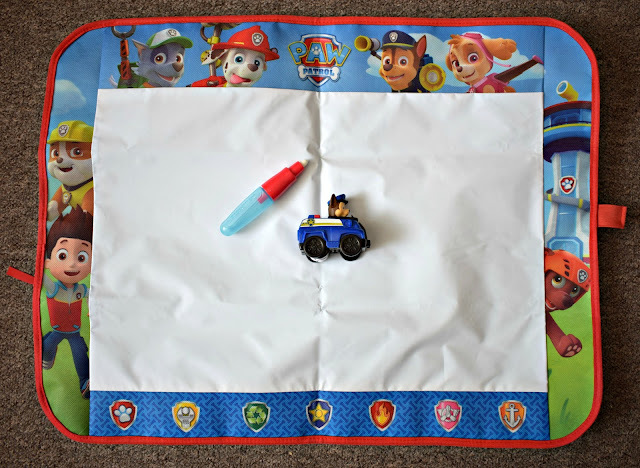 The Paw Patrol Aquadodle is suitable for children aged 2 years + but I would say it can be used as soon as they are able to grasp a pen (the chunky style pen supplied makes it super easy to grip!). Even James who is 7 has enjoyed having a doodle. The Tomy Paw Patrol Aquadoodle is currently available to purchase from Toys R Us, Argos and Amazon! This sounds great. We saw the Aquadoodle activity sets at the Manchester pet show last year and they do look great!